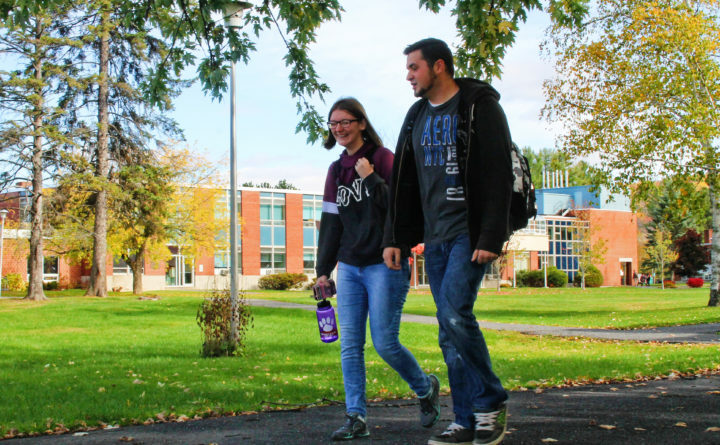 Students walk between classes in October on the University of Maine at Fort Kent campus. Some professors at Maine’s state universities are worried a new policy could inhibit them from using their expertise to inform lawmakers, students and the public. Some professors at Maine’s state universities are worried a new policy aimed at protecting the institutions’ nonprofit status by barring employees from engaging in political activities on university time or resources could inhibit them from using their expertise to inform lawmakers, students and the public. University of Maine System leadership decided to take a fresh look at its free speech and civility policies in the wake of 2016’s contentious presidential election. Concerned about recent protests, unrest and heated debates about how potentially divisive speech should be treated, student representatives asked the board to review the system’s rules to help campuses navigate free speech issues. The system hadn’t amended its free speech and civility policies since 1974. One year later, the system is weighing a second change, a new policy on “Institutional Authority on Political Matters,” which states that all legislative advocacy must be coordinated through the chancellor’s office, and only by certain high-level employees. This concept has drawn some criticism since a draft version of the policy started circulating among faculty members last month. Faculty groups worry it might be a step toward limiting how and where professors and researchers are allowed to express their views or share their research and expertise. Administrators say the addition will protect the system and its campuses from losing federal funding or their nonprofit status. If employees use their roles to endorse particular political causes or candidates, that tax-exempt status and funding could be challenged. He said the University of Maine System shouldn’t be the one to test those waters. Jim McClymer, president of the faculty union Associated Faculties of the Universities of Maine, said he’s fielded many concerns about the proposed policy. While the policy appears to protect professors’ ability to speak about sensitive political issues in the classroom, he said, faculty members worry that some of its restrictions will hinder their ability to use their research and knowledge to benefit their students or the state. He also questioned whether the language might restrict faculty from participating in, or even being seen at, an on-campus political rally. As written, it also raises the question of whether student employees might not be able to join political clubs or be involved in organizing political events. Thelen said it’s not the intention to bar faculty from using their expertise or educating lawmakers, and that portions of the policy likely will be reworked to resolve some of these concerns. He’s scheduled to meet with several faculty representatives later this month to talk through their concerns. He said he was “almost positive” some aspects of the proposal would change, but couldn’t say at this point how they might change. Originally, the University of Maine System board of trustees was expected to decide whether to adopt the policy at its Jan. 28-29 meeting, but that’s likely to be delayed until the March meeting. Thelen expects to make some changes to the proposal and present it as a discussion item to the board during this month’s meeting. Debates surrounding free speech have erupted across the nation since the 2016 election, with some schools barring speakers with controversial viewpoints or protesters disrupting their events. Other schools have had to fashion rules to try to avoid such fallout. Still other schools are being challenged, as decades-old policies come under the microscope. A portion of the University of Massachusetts at Amherst’s policy on demonstrations and speeches allows such events between the hours of noon and 1 p.m. and only at a certain location on campus. That policy has been in place since 1990, but has found fresh scrutiny since debates over free speech on campuses ramped up.